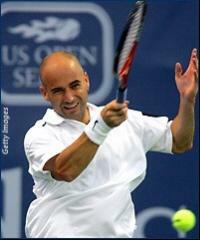 LOS ANGELES (Ticker) - Top seed Andre Agassi of the U.S. hopes to continue his recent good form when he takes on German Tommy Haas in the quarterfinals of the $380,000 Mercedes-Benz Cup on Friday night. The 34-year-old Agassi had lost four straight matches before posting a 6-3, 6-1 triumph over fellow American Alex Bogomolov Jr. on Tuesday - his 800th career win but first since March at the NASDAQ in Miami. Agassi, who has been suffering from inflammation in his right hip, followed with a 7-6 (7-4), 6-2 victory over Julien Benneteau of France on Thursday. Haas has been even sharper, upsetting eighth-seeded American Robby Ginepri in the first round, 6-4, 6-3, and dominating Kenneth Carlsen of Denmark, 6-2, 6-0. In other quarterfinal matches Friday, third seed Mardy Fish of the U.S. meets Frenchman Cyril Saulnier; American wild card Jeff Morrison opposes Wesley Moodie of South Africa; and Brit Greg Rusedski takes on German Nicolas Kiefer. First prize is $52,000.